Australia Day is one of our all-time favourite holidays. A day where we get to celebrate the million reasons we love Australia. One thing us aussies are renowned for is BBQing. No matter what, it seems we can BBQ anything: meat, fruit, vegetables, eggs, you name it… we’ve BBQed it. We’re still learning tips + tricks on how to BBQ awesomely (Merrymaker Dad gives us lessons, who, even though over cooks the steak + chicken sometimes, knows his stuff) but we’ve got a BBQ success story + had to share it IMMEDIATELY (just in time for Australia Day celebrations). Roast is yum, yes? BBQs are the best, yes? Put these together + you have all kinds of amazing. 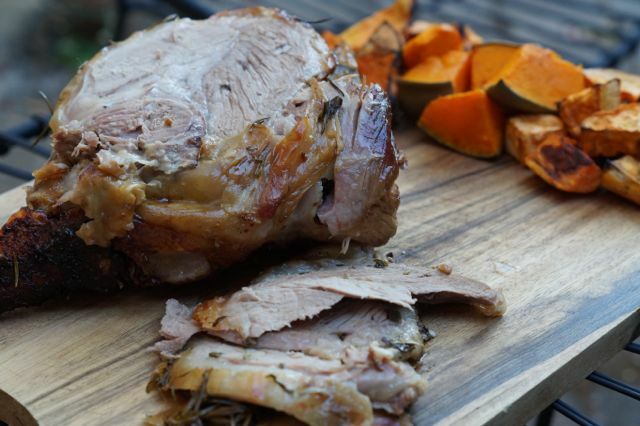 Introducing: paleo lamb roast in the BBQ! Roasting lamb in the BBQ makes for the most tender of meats, results in no stuffy kitchen from the hot oven + even though it’s maybe one of the easiest recipes (ever), it’s kind of impressive! Plus if you’re the patriotic kind you really can’t get much aussie-er than this. Here’s what we suggest: get together with a bunch of your nearest + dearest + BBQ your lamb this Australia Day! Plus, we’ve already got the perfect accompaniments to go with your paleo lamb roast in the BBQ like our caramelised roast pumpkin, summer salad + prawns wrapped in bacon. If that’s not the perfect Australia Day menu then we don’t know what is! Not to mention… we also have a paleo pavlova recipe. Yes, we said paleo pavlova! After more Australia Day recipes? Check out our paleo lamingtons! paleo lamb roast in the BBQ. Turn all of the burners of your BBQ on to medium (the BBQ should be around 180-200 degrees celsius) a part from 1 burner - this will be where the roast will sit (you don't want your roast to be right on top of any heat as it will burn). Cut small slits into the skin of the lamb + press slices of garlic + sprigs of rosemary into the lamb. Rub with coconut oil + season with salt + pepper. To keep things 'clean' we like to place our roast into an oven bag (you don't have to do this) + then onto a baking tray or rack. Place the tray/rack into the preheated BBQ onto the burner that IS NOT on. Depending on how big your roast is, allow to cook for around 30 minutes per 500g. Once cooked allow to sit for 10 minutes before slicing + serving. We love Niulife coconut oil.